Nature speaks and I am listening. A decade ago, when I studied in Central America with the Rainforest Business Institute, I was fascinated by the opportunity to apply lessons from nature found within the world’s most productive ecosystem to principles of business. Because of my educational background in horticulture, concepts such as biodiversity, symbiotic relationships, fungigation, and pest control translated practically into the business realm. Concern about depletion of the tropical rainforest and the effects on climate and the environment became real as I visited the village of an indigenous tribe of Indians and observed first-hand the major life-style changes they were forced to make to adapt to unwanted change. Little did I know I would later be dealing personally with the effects of deforestation. It came in quite an unexpected way to our home in Northwest Florida as a result of Hurricane Michael’s devastation. On October 10, 2018, when the 155 mph winds came ashore at Mexico Beach (the eastern end of Bay County) – many counties suffered catastrophic damage. Thousands of homes and businesses were severely damaged or destroyed. Florida’s Panhandle lost 2.6 million acres of trees. Over the last few months, one of the major effects of deforestation – flooding – is on my doorstep. I live on 20 acres north of Panama City in an area called the Sand Hills – a fascinating part of the Econfina Water Management district. Not far from Florida’s Gulf Coast, we enjoy a subtropical climate. Thus our timberlands can be called subtropical forest. When flying in and out of any airport in Northwest Florida, the canopy of trees was distinctive. I took it for granted until it was decimated. And the ripple effect of changes to the land is startling. My husband has always made sure we had a large garden every year. We had chickens and even some cows grazed the back pasture. None of that is happening this year. Instead, we have the sound of waves slapping against our home. It’s like being on a houseboat with a distinct disadvantage – it doesn’t float! Unprecedented flooding has driven us from our home of 19 years. We were watchful when a small pond on our neighbor’s property began to spread out and encroach on our land after Hurricane Michael. In November, we were wary and started conserving water with some concern about water tables and our drain field. In December we were alarmed as the water encroached into my husband’s workshop. In January, I packed up all our belongings and made temporary living arrangements. The rarity and complexity of this problem means there are no simple answers. So while we live in limbo – not knowing when the water will stop rising and how long it will take it to recede, I consider what I am learning. 1. Nothing happens without affecting something else. In 1963, Edward Lorenz made a presentation to the New York Academy of Scientists on something called the “Butterfly Effect”. His theory stated that the flapping of a butterfly’s wings could stir air molecules that could eventually influence weather patterns across the world. For years, his theory wasn’t taken seriously. But in the mid 1990s, collaborative work by a number of respected physicists proved that the butterfly effect is accurate, viable, and consistent. 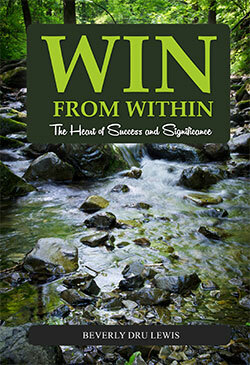 This has practical ramifications in our lives and businesses. It’s folly to think our actions don’t affect others. 2. Every bad thing that happens carries within it the seed of good, if you’ll strengthen your heart and mind so you can see it. For example, when the new year dawned, I had no idea that within the month, I would be packing up all the belongings I’d amassed while living in one place for two decades. I encouraged myself with the thought that this was compulsory decluttering and that I am making room for a new era. Not just a new season – this is bigger! Something good is coming. 3. Disastrous circumstances can bring out the worst in some people, but for many – it brings out the best. In the aftermath of Hurricane Michael, we’ve seen neighbors helping one another, communities working together like never before, and the blurring of racial and socio-economic lines as we each contribute what we can to recovery and restoration. It might be a pot of soup, a coat for someone who needs it, a tent, a place to stay…the needs are many but the provision is beautiful. 4. Never underestimate the power of a kind word or gesture. Everyone you meet is going through something. 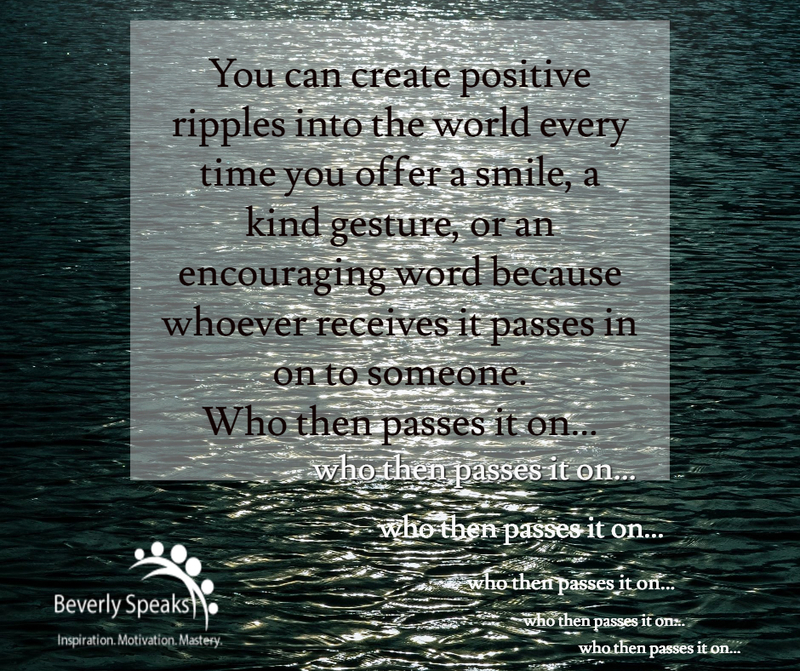 You can create positive ripples into the world every time you offer a smile, a kind gesture, or an encouraging word because whoever receives it passes in on to someone. And it goes on, and on, and on. 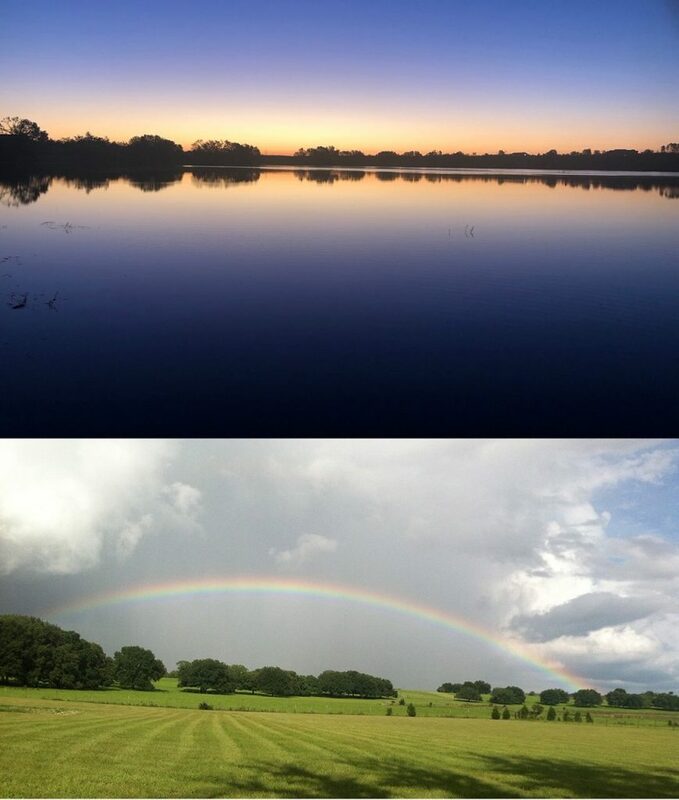 Top photo is the present – same view as the bottom which was taken on a summer day.